We caught up with them at last week's Spring Thing as they recounted their tale of inventiveness in getting the huge frozen dog reunited with its owner. A true tale of selflessness that reminds us that humans aren't so bad, when they make the time for empathy. Two of the team of dog rescuers "tag team" the rescue of Red Dog. Jenny Abegg (left) assists Rebecca Yaguda load up the frozen dog. Rebecca Yaguda gets an assist climbing up with the heavy load of a big wet dog. 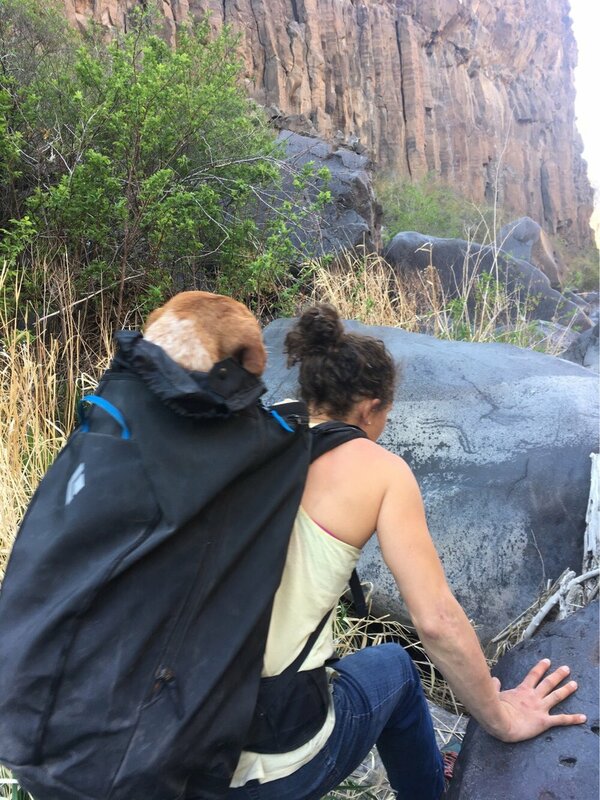 Rebecca Yaguda finds a new use for her pack in helping a freezing wet dog out of The Gorge at Smith Rock. While we don't know the details of how Red Dog got separated from her owner, we do know that the Crooked River, especially in The Gorge has rapids that have been bad news for both dogs and humans. The rocks can get slick in places from water erosion and lichen doesn't make for stable foot contact. Just a few days before we got word of another dog that was missing for two days, this time from being off leash and falling into the irrigation canal at the start of the Burma Road Trail. The current gets very strong by the entrance to the tunnel, and the dog got swept through the pipe and shot out the other side. Help keep your dog safe by keeping them on a leash, especially around water.